The lower Huron River begins downstream of French Landing Dam that creates Belleville Lake in Charter Township of Van Buren, and flows for nearly 29 miles before entering Lake Erie. 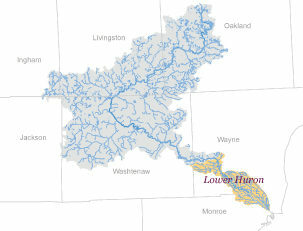 A tributary stream network of more than 100 miles flows into the lower Huron River. The 74 square mile watershed drains all or portions of fourteen municipalities in Wayne and Monroe counties. For additional information on water quality in the Lower Huron, visit our Infostream. The Lower Huron River Watershed Management Plan guides restoration in this part of the watershed. The Plan was developed by the communities, with the Huron River Watershed Council serving as author and facilitator. HRWC has worked with communities in the Lower Huron in a variety of ways, but mainly through a stormwater management advisory committees. The first of such groups, called the Lower Huron Watershed Advisory Group, was formed in 2004 to address stormwater pollution issues and develop the Lower Huron Watershed Management Plan. 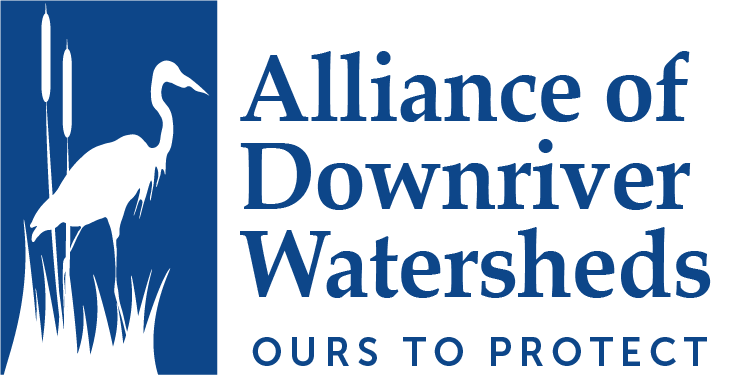 In 2007, Lower Huron Watershed Advisory Group joined with similar groups in Ecorse Creek and the combined Downriver watersheds to form the Alliance of Downriver Watersheds (ADW). For additional information on the ADW, click here or contact Ric Lawson.